A very big crafty hello! 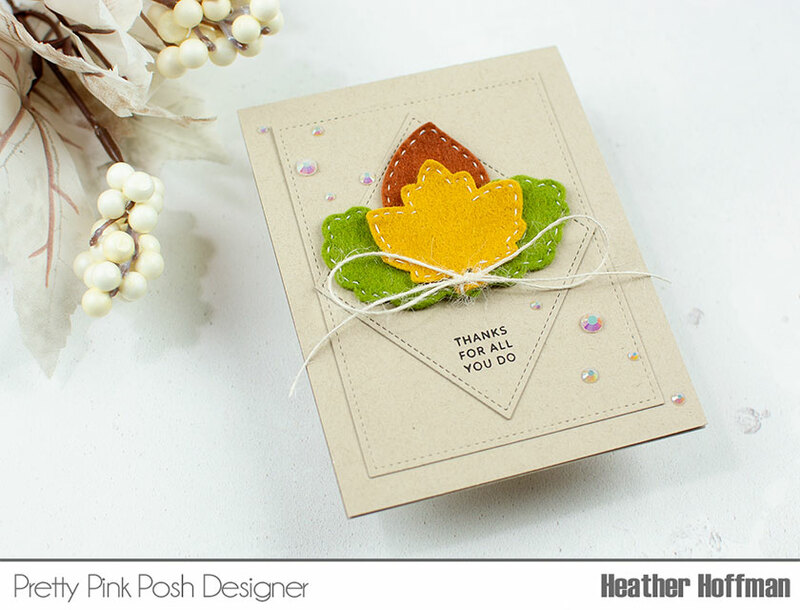 Welcome to Day 2 of our very special blog hop collaboration with Pretty Pink Posh and Glue Dots Adhesives! 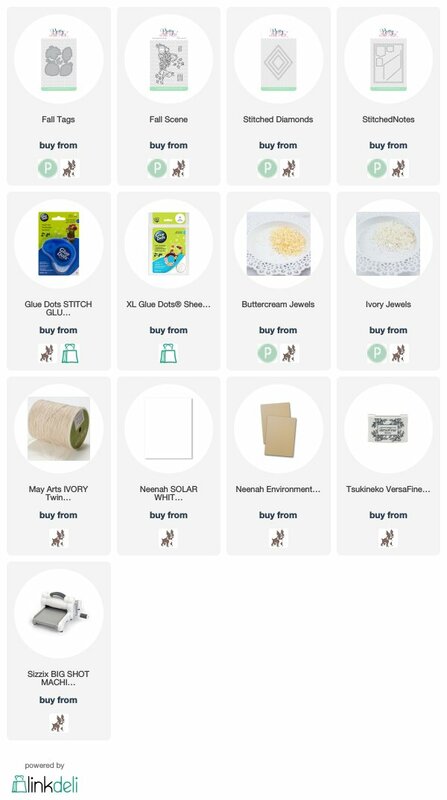 This is Day 2 of a fun blog hop with PRIZES from both companies up for grabs, along with inspiration and videos. 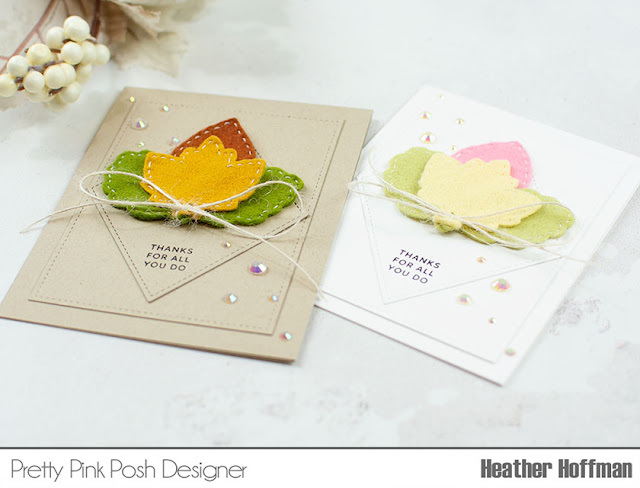 The talented crafters along the hop will be bringing you an array of projects, coloring inspiration, and a variety of ways to have fun with both Pretty Pink Posh and Glue Dots collectively! The entire list of stops along the blog hop are listed at the bottom of this post - as well as info on the prizes up for grabs, so keep reading! For my cards, I pulled out some felt and my Pretty Pink Posh Fall Tags Dies - and put that super sturdy adhesive to good use! I used some felt from my stash, and was just crazy enough to pull out my needle and thread and hand stitch around each leaf! I used the cuts from the dies as a guide - because even though they didn't show up well alone on the felt, they still cut through nice and clean and clear. Once each one was stitched, I die cut a Stitched Diamond, gathered them into a cluster, and then used the XL Glue Dots sheets to attach them down. Worked like a dream! I also die cut a rectangle from Stitched Notes Dies, then used the Glue Dots Stitch Glue Squares tape runner to attach the layers all together. I bundled some twine through the holes at the bottoms of the tags, and tied in a pretty bow, and stamped a sentiment from Fall Scene at the bottom of each. 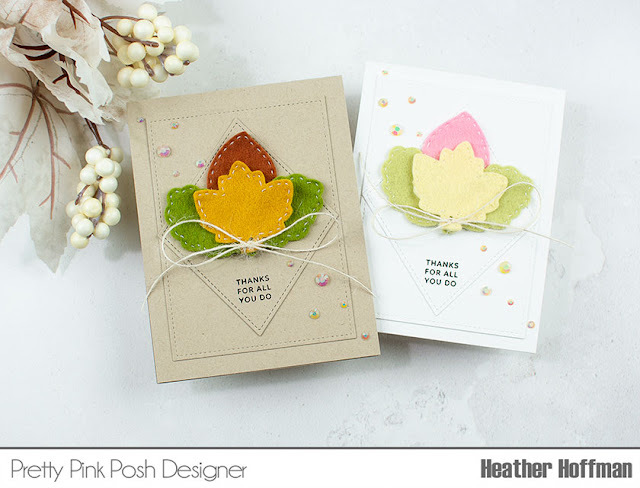 Finished off with a sprinkling of jewels - Buttercream on the card with brighter spring colored leaves, and Ivory on the more traditional fall colored one. To win one of these prizes - leave a comment on each stop along the hop! Winners will be chosen at random fro comments left on all blogs along the hop by 6:00 AM PST on October 23rd. Winners will be announced on the Pretty Pink Posh Blog and Glue Dots Blog. Gorgeous! Love the fall and spring felt leaves. The stitching around the leaves are a perfect detail. I don't think I have seen you use felt OR thread before! Love what you created!! What a cute way of using up felt scraps! I'll have to save this idea for my overflowing stash! 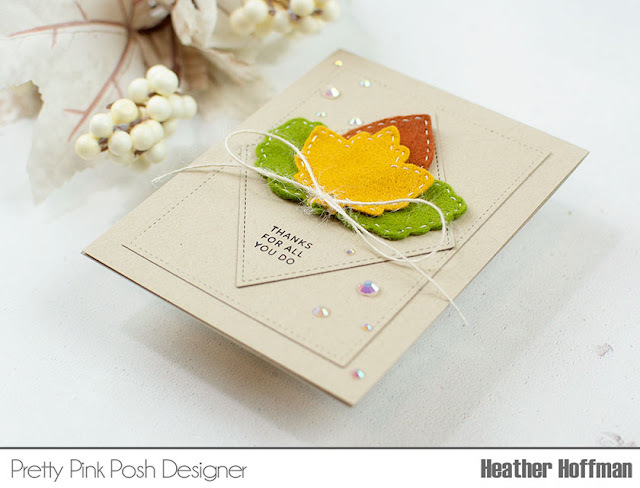 Pretty fall card, I love felt on cards. Love your felt leaf cards! So pretty--love the use of felt. 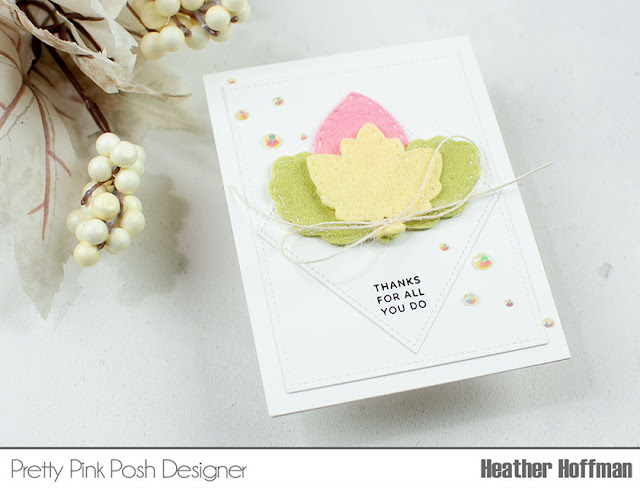 Your cards are always so lovely, Heather! The stitching is such a nice touch on the leaves. This has been a fun blog hop with PPP and Glue Dots. Lovely cards. Love the hand stitched leaves! I love the idea of the felt. Great idea and I am sure the glue sheet really helped. Liquid adhesive would just make a mess. Great idea on using this. I must keep it in mind. I love your cards and the added stitching and die you used. Beautiful. What a great idea! I love how you sewed the felt and did it in two color combos!!! How beautiful are these Heather? Love the felt leaves, especially the darker ones. 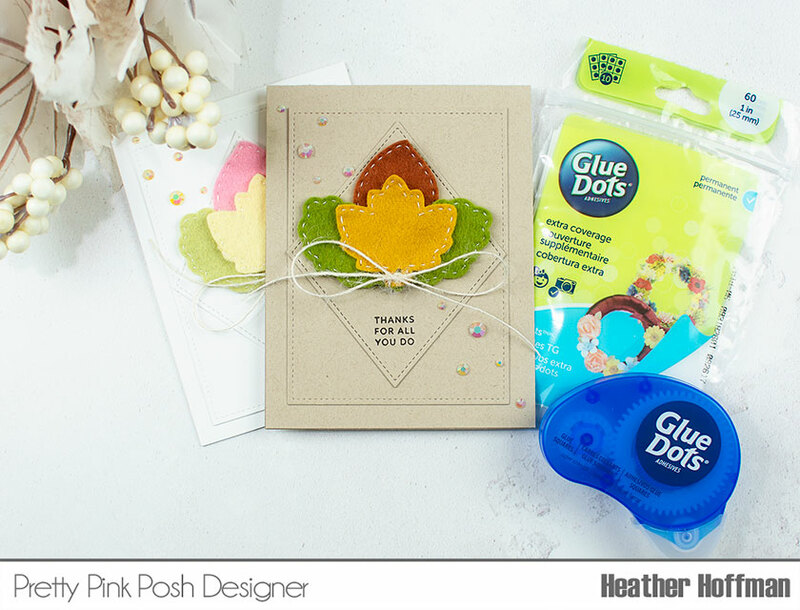 One thing is for sure, with glue dots you don't need to worry about your felt staying on your cards. That is what I love about them, they will hold ANYTHING! Well done! idea for a fall leaf. Wonderful cards. What a great and modern design, I especially love the first card - obsessed with kraft myself recently! both color combos used as well. Love the design! those are lovely! what a great idea to use the dies for felt instead of just paper. i wish you the best for your mission. Your time in stitching really paid off. It looks great! This might be good practice with my granddaughters. Nicely done. Aren’t these cards lovely. Thanks for sharing! What pretty thank you cards. I love that you used the felt. Thank you for sharing. Wonderful cards! I love the 2 different colour combos! Beautiful cards! Love the different color combos! Fun detail with the stitching! Beautiful cards! I love the felt and hand stitching. I love the die cuts in felt! and Craft Glue Dots are perfect for adhering felt! I love the beautiful simplicity of your cards! They are unique and inspiring! Beautiful! Love the use of the felt. Love the felt leaves. Great project.